*** DECEPTIVELY SPACIOUS *** TASTEFULLY MODERNISED *** INDIVIDUAL DESIGN *** PLEASANT EASILY ACCESSIBLE VILLAGE HANDY FOR DARLINGTON *** CENTRAL HEATING *** DOUBLE GLAZING *** Entrance Porch, Hall, Lounge, Kitchen/Dining Room, Utility Room, Study, 4 Bedrooms, En-Suite Shower Room, Family Bathroom/WC, Family Shower Room/WC, Attached Garage, Ample Parking, Front and Rear Gardens, Oil Fired Central Heating, UPVC Double Glazing. NO FORWARD CHAIN. ENTRANCE PORCH Ceramic tiled floor, coving. UPVC double glazed entrance door to front. UPVC double glazed door to Hall with internal double glazed window to side. UPVC double glazed windows to either side. HALL Cloak cupboard, dark oak effect laminate floor, two radiators, access to part boarded loft space with light, drop down hatch and fold down wooden ladder. UPVC double glazed door to Entrance Porch with internal double glazed window to side. 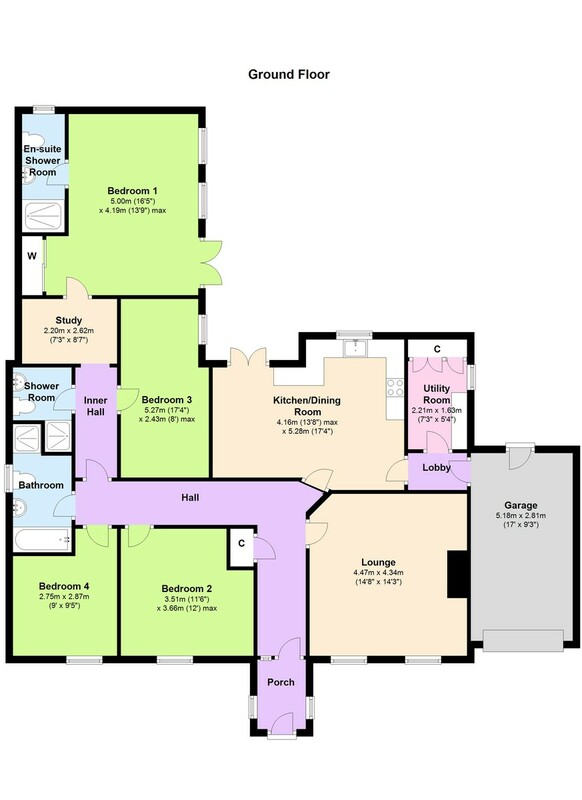 Doors to Lounge, Kitchen/Dining Room, Bedroom 2, Bedroom 4, Bathroom/WC and Inner Hall. LOUNGE 14' 8" x 14' 3" (4.47m x 4.34m) Coving, television point, cast iron multi-fuel stove, dark oak effect laminate floor, radiator. Double glazed windows to front. Door to Hall. KITCHEN/DINING ROOM 13' 8" x 17' 4" (4.17m x 5.28m) (maximum measurements). Cream tiled surrounds, stainless steel one and a half bowl sink unit, sparkle granite work surfaces, white gloss cupboards and drawers with chrome handles, built-in electric oven and ceramic induction hob with stainless steel extractor hood over, built-in dishwasher, fridge/freezer space, under lighting to cupboards, LED ceiling spotlights, television point, two radiators, polished ceramic tiled floor. Double glazed double doors to Rear Garden. Double glazed window to rear. Doors to Utility Room and Hall. LOBBY Polished ceramic tiled floor, ceiling LED spotlights. Doors to Kitchen/Dining Room, Utility Room and Garage. UTILITY ROOM 7' 3" x 5' 4" (2.21m x 1.63m) Polished ceramic tiled floor, white gloss cupboards with chrome handles, plumbing for washing machine, tumble dryer space, radiator, concealed oil fired Worcester Combi condensing boiler (installed in 2015). Double glazed window to side. Door to Lobby. BEDROOM 2 11' 6" x 12' (3.51m x 3.66m) Telephone point, television point, radiator, ceiling LED spotlights. Double glazed window to front. Door to Hall. BEDROOM 4 9' x 9' 5" (2.74m x 2.87m) Television point, dark oak affect laminate floor, radiator. Double glazed window to front. Door to Hall. FAMILY BATHROOM/WC Fully tiled walls, pedestal wash hand basin, panelled bath, separate shower cubicle with Mira Sport electric shower, low level WC, chrome heated towel ladder, ceiling LED spotlights, fitted wall mirror, electric shaver point. Double glazed window to side. Door to Hall. INNER HALL Chinese solid oak floor, coving. Doors to Hall, Bedroom 3 and Family Shower Room/WC. Doorway to Study. BEDROOM 3 17' 4" x 8' (5.28m x 2.44m) (maximum measurements). Chinese solid oak floor, coving, ceiling LED spotlights, radiator. Double glazed window to side. Door to Inner Hall. FAMILY SHOWER ROOM/WC Pedestal wash hand basin with tiled splashback, tiled shower cubicle with Mira Vie electric shower, extractor fan, low level WC, ceiling LED spotlights, chrome heated towel ladder, ceramic tiled floor, fitted wall mirror with light. Door to Inner Hall. STUDY 7' 3" x 8' 7" (2.21m x 2.62m) Chinese solid oak floor, coving, radiator, ceiling skytube. Door to Bedroom 1. Doorway to Inner Hall. BEDROOM 1 16' 5" x 13' 9" (5m x 4.19m) (maximum measurements). Coving, television point, radiator, built-in wardrobes with sliding mirror doors. Double glazed double doors to Rear Garden. Double glazed windows to side. Doors to Study and En-Suite Shower Room/WC. EN-SUITE SHOWER ROOM/WC Pedestal wash hand basin with tiled splashback, large tiled shower cubicle with Aqualisa electric shower, extractor fan, low level WC, ceiling LED spotlights, chrome heated towel ladder, ceramic tiled floor. Double glazed window to rear. Door to Bedroom 1. GARAGE 17' x 9' 3" (5.18m x 2.82m) Power connected, up and over roller shutter door to front, fitted shelving. UPVC double glazed entrance door to rear. Door to Lobby. FRONT GARDEN Lawn, flower beds, shrubs, apple, pear and plum trees, large stone flagged patio, security lights, gravel driveway providing ample parking with solar powered lighting bollards.